We are thrilled to have connected with the talented Urvi Tejani, Creative Director and Founder of Tejani Jewelry for our September Vendor Spotlight. By combining her keen NYC fashion sense with the designs of local Mumbai Indian craftsman, Urvi brings a bridal jewelry collection with a carefully crafted mix of authentic ethnic heritage and bold modern flair. The name Tejani translates to “brightness” and “sparkle” in Hindi — a fitting description for the original pieces in her collection. “When I started back in 2004, high couture jewelry and accessories were out of reach of most brides, yet the more affordable pieces were unattractive and poor quality,” says Urvi. With Tejani Jewelry, she makes the effort to give clients that exclusive look for much less! Check out our Q&A with Urvi about how to best research for bridal jewelry, the importance of culture in her collection and the exciting future in-store for Tejani! tanaRi events (TE): When did Tejani Jewelry begin its road to success? Tejani Jewelry (TJ): Tejani was started in May of 2004. TE:What inspired you to start your business in making jewelry for brides? TJ: When I was getting married, I saw a huge void for better costume bridal jewelry. I felt that either it all looked very cheap, lacked fashion & style or was real (fine jewelry) and out of my budget. I feel many ideas and businesses are born from when we are actually in search of the product / service for our needs. Access your dress. What would be the perfect accessories to compliment a beaded gown, sash, asymmetrical style? These are all very important factors to consider. What is your personal style? This is not the day to step out of your comfort zone nor take any chances in accessorizing with pieces that don’t reflect who you are. Establish a rough budget of how much you want to spend on your jewelry. As far as the actual researching, I would recommend looking online at blogs and bridal websites for inspiration. Style Me Pretty & The Knot are two personal favorites. Boutiques and bridal stores are always a good place to look as well. There is nothing better than actually being able to see the pieces in person prior to making a purchase — especially when it comes to earrings. I would also recommend selecting a few (ie. up to five options) to bring to your fitting. Any more will be too overwhelming, but you definitely want to have a few. TE: Once a bride commits to her budget & creative vision, when do you recommend that a bride start thinking about and exploring their bridal jewelry options? TJ: I recommend that brides start looking for jewelry right after their first fitting. That way she is more than likely to remember the exact details, color & style. Also, if she starts exploring soon after her first fitting, then she can bring her selections to the 2nd fitting; (In many cases, it may be the final fitting!) In addition, it is extremely important that the bride have a dress rehearsal with herself prior to her big day. The last thing she wants is to realize her jewelry selections do not compliment her gown before walking down the aisle..
TE: You’ve picked a great area of the wedding business to focus on! Many brides express their concerns about staying in budget but don’t want to sacrifice the quality of the jewelry. What is the price range of your items? TJ: The collection ranges from $50 USD to $300 USD. TE: Wow! That is a very reasonable price range for beautiful pieces in your collection. 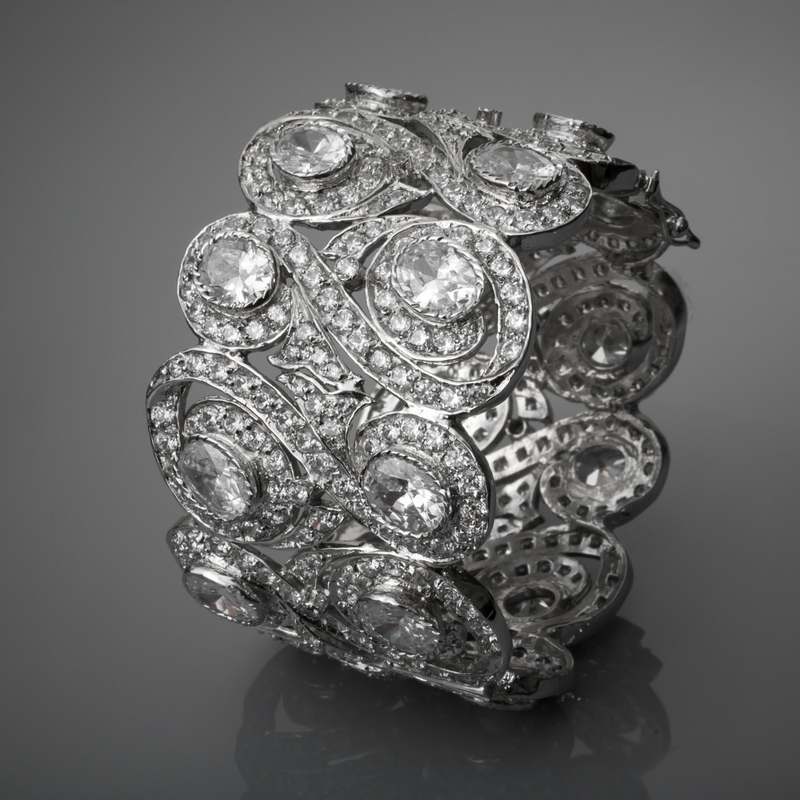 This may be a tough question, but if you had to pick – what is your favorite piece of jewelry in your collection? 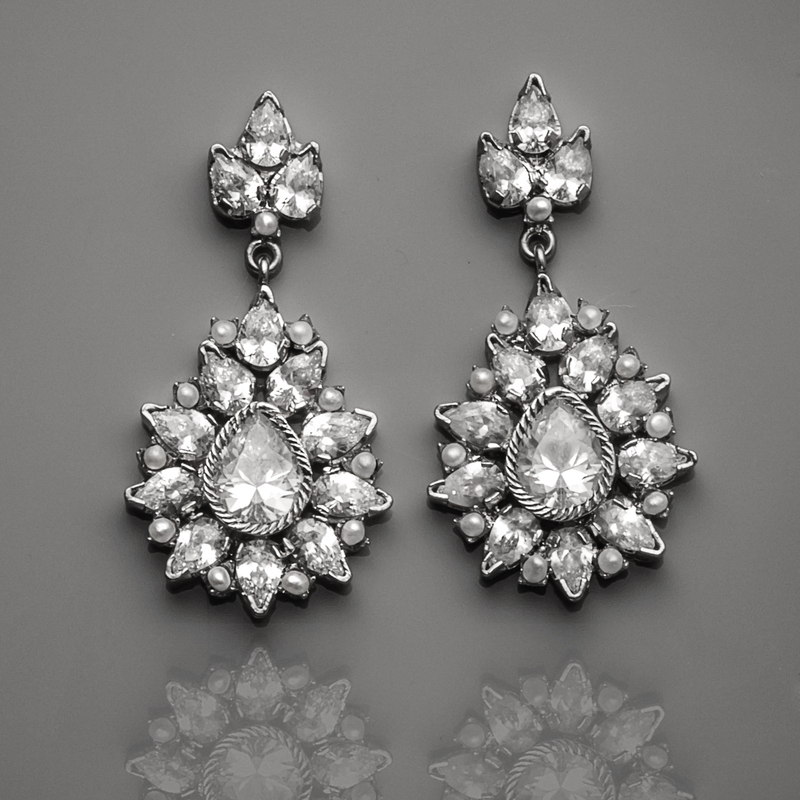 TJ: My favorite piece in the collection is Yamini Statement Chandelier Earrings. 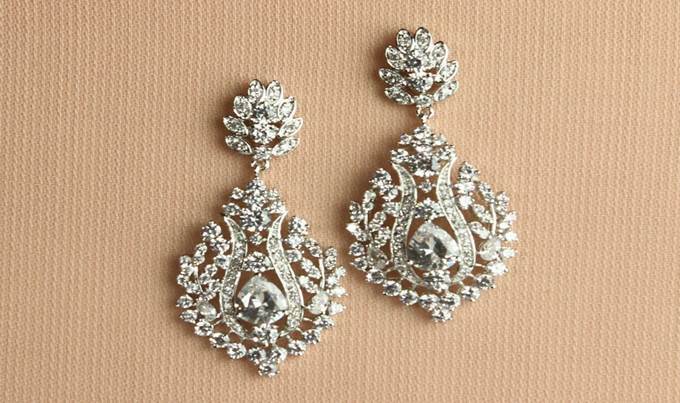 I absolutely love the ultra -glam look of these earrings. TE: Do you have a favorite stone/color to work with? TJ: I actually do not work with many color stones. 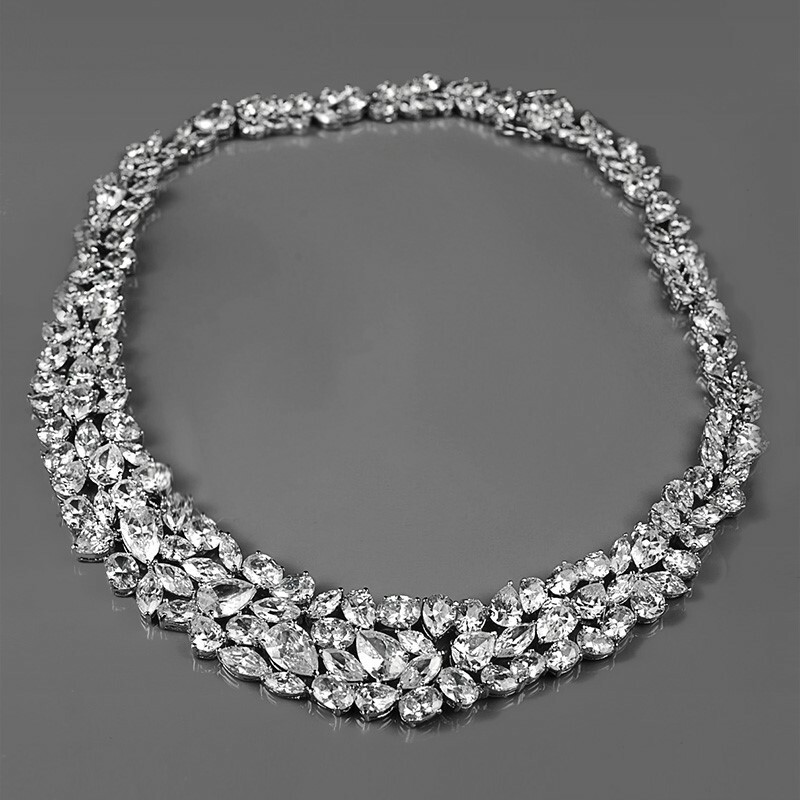 Clear Austrian crystals and Cubic Zirconia are primarily the stones used in the collection. TE: What is your most popular piece of jewelry and/or accessory? TE: It’s clear by looking at all of these designs that your heritage is very important to you. How does that get incorporated into your designs? How do you use those elements as inspiration? TJ: My heritage is very important to me. Being born in India and coming to the US at a very early age (3 months) really made me want to give back in a way that would showcase and represent the beautiful craftsmanship of my culture. Each piece is designed and crafted by local artisans throughout India. I do not actually design nor know how to draw. But, what I do know is how to select and merchandise a collection that represents local talent, yet is sellable to a worldwide bride. TE: Once a bride chooses their jewelry, how long does it take to be ready/delivered? TJ: We try to stock as many pieces in the collection as possible. Once a bride orders her jewelry, it typically takes 3-4 business days to be delivered. TE: It seems that most of your inventory is already pre-made. Do you make custom bridal jewelry designs if a client requests something so specific that it isn’t readily available? TJ: Tejani does not offer custom bridal jewelry designs. She would have to choose from the pieces available on the website. TE: We can’t wait to see what the future holds Tejani designs! What is in the works for the near future – any new products? Company developments? Trends come and go and we have definitely tried to cover them all. However, at the moment with such a competitive and over saturated market. We realize our strengths and weaknesses and are focusing on what the TEJANI brides love the most! POST INTERVIEW QUESTIONS: We thought a fun way for us to close out the Q&A is to do a speed round of questions to get to know you better and share your advice and expertise in a moments’ notice for all types of brides. Here we go…! TE: What is your personal favorite accessory? TJ: My favorite accessory is bold statement cuff. TE: What are your go-to looks for the following brides? TJ: Beach Bride: I love the look of casual yet formal elegance for a beach wedding. 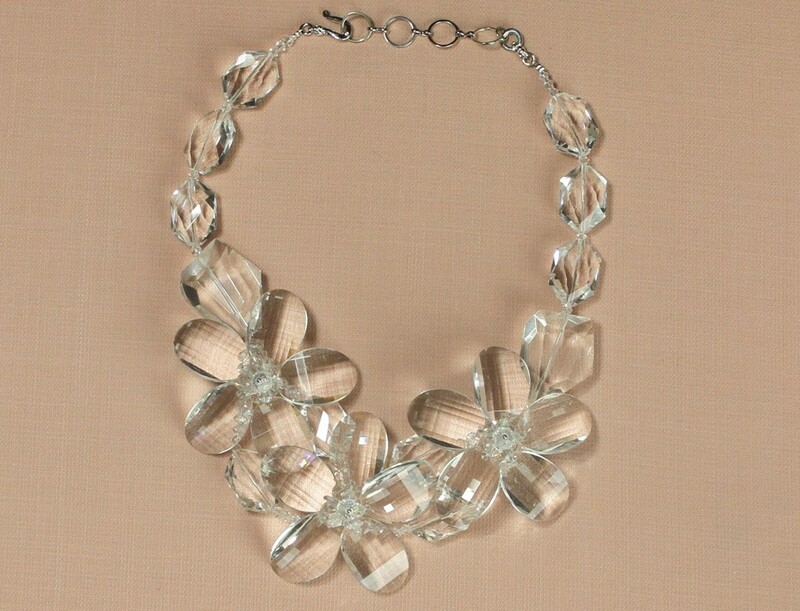 This clear crystal necklace is the perfect statement necklace to complete a light airy chiffon gown. Also, stackable bangles are always a fun beach look where no one will even hear the clanking. 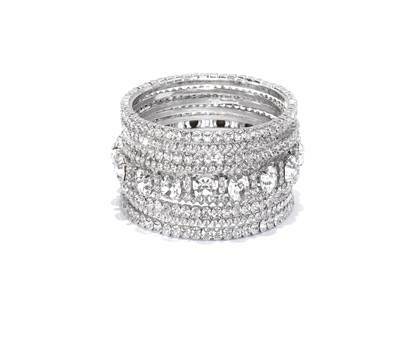 Wearing only a few or stacking the entire look is the perfect accessory to say “I do”. They also would be so much fun to bring for the honeymoon. Rustic Wedding: Pearls are the perfect balance to compliment a rustic wedding…….Romance meets roughness!!!! Formal Ball Room: Glam, Glam, Glam!!!!!! I love a statement necklace or killer show stopper earrings and a cuff to complete a formal wedding look! There is NEVER too much bling when it comes to black-tie. Bohemian bride: When I think Bohemian, I always prefer to add the chicness factor to give Boho a touch of glam! These Nandi earrings are the PERFECT amount of GLAM but still can be ultra boho! 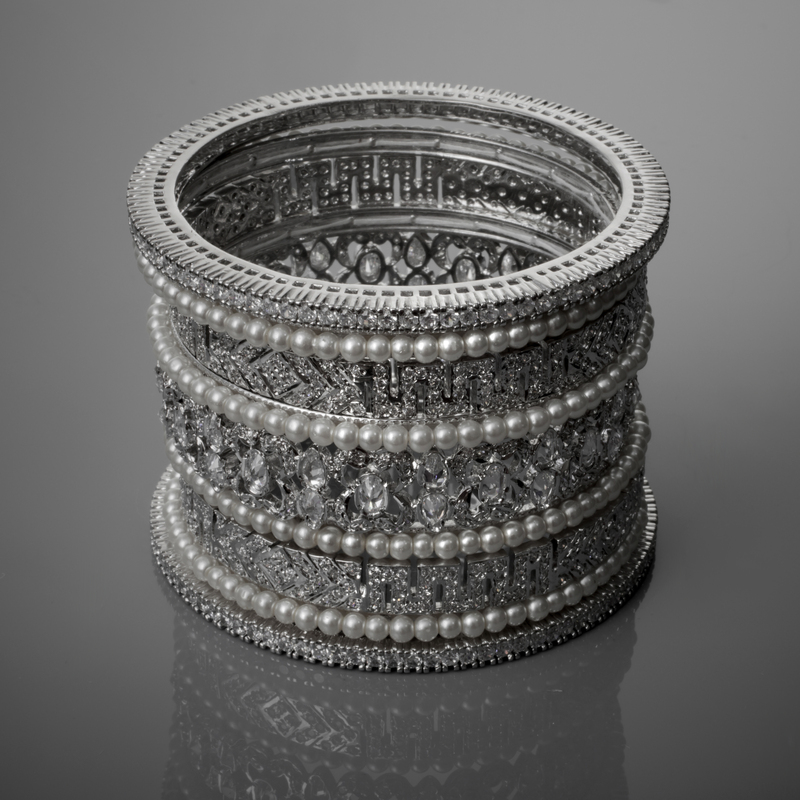 Maharani Bride: Bangles, bangles , bangles! Plenty of arm candy is the way to go for the Maharani Bride…….A stack of the Anandini bangles on both arms in Antique Gold or Traditional gold . Be sure to check out their website and social media pages to learn more about their unique line of products and how you can contact them for inquiries! Feel free to also contact us and we can put you in the right direction! ALERT TO THE MEN AND WOMEN PLANNING TO PROPOSE TO THEIR PARTNERS: This is your time to get creative! While the big wedding decisions might be made by your “better half”, this is your time to show the person you love how much you mean to them by incorporating fun, yet personal elements to your proposal. For those struggling for ideas – here’s our general list of “engagement styles” and how you can tweak them to your personal taste! 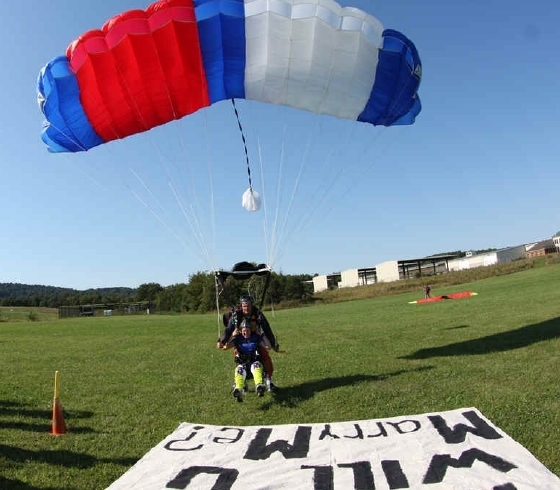 Destination proposal: for a more “adventurous” experience for you both, whisk your partner away on a vacation that you’ve always wanted to take together. This could be as extravagant as a trip to the city of romance (Paris) or the mountains in New Zealand or taking a drive to a B&B where you can have a more serene trip. Family proposal: for many, it is important that the families be incorporated into the day of the proposal. Whether that be seeing your family after you’ve already done it or using them as decoys in the process, we understand why one would want to include them. Just make sure that if they know the plans – they better be good at keeping secrets! 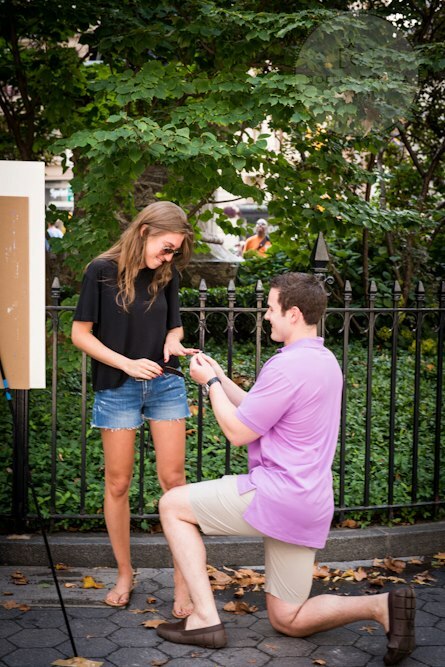 Intimate proposal: sometimes it’s about the simple things & you don’t want any disruptions.